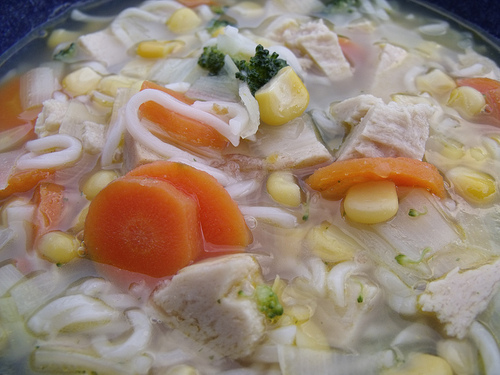 Makes a good six bowls – a nutritious, easily digested soup. Bring the water to the boil as you prepare and add the vegetables and noodles. Let simmer for about 10 minutes then mix the miso in a cup of hot but not boiling water to disolve it. 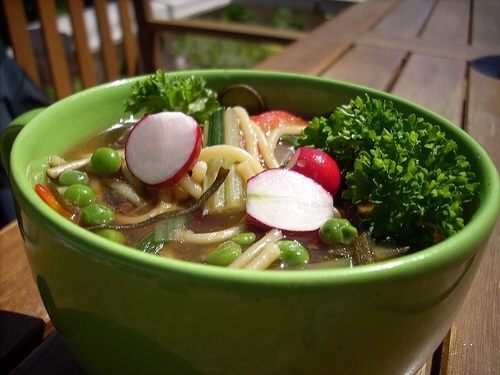 Take the soup off the heat once the noodles are soft and mix in the miso and salt. and is garnished with radish and parsley. Place the lentils in a large pan and cover with water. Bring to the boil and turn down to simmer. Prepare the vegetables and add to the pan with the tomatoes, pasta, stock and herbs – add more water if you need, if too thick. Cook at a low simmer until veg and pasta are tender, (probably about 20 minutes). Add the greens for the last couple of minutes of cooking time and season to taste. Using up leftover redwood turkey roast here but you could also use a pack of cheatin chicken or indeed leave out the meat sub altogether – it’s the veg that makes it delicious anyway! 1 pack of vegan noodles (supernoodle style though other cheaper brands are just as good – discard the flavour sachet). Alternatively you could use some spaghetti or other pasta/noodles of your choice broken up and increase cooking time a bit. 1 small peeled white potato CHOPPED! Very simple to prepare this one! Place all your vegetables except the chard in a large pan with the barley. Cover well with water, boil and simmer until everything is cooked. Add the chard and salt and cook for another 5 minutes. A chunky, filling winter soup. 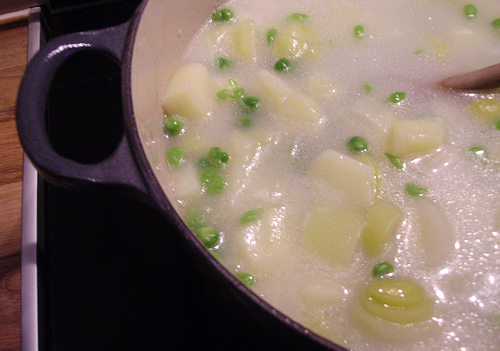 These quantities make a large pan of soup – they can easily be reduced by half if desired. Cook the leeks and garlic, if using, in the sunflower oil for a few minutes then stir in the flour. Add one cup of water and stir well to blend. Add the potatoes and the rest of the water (you may need to adjust the quantity slightly – make sure all the vegetables are well covered). Bring to the boil, stirring occasionally to prevent sticking, and then turn down to simmer until the potatoes are just about cooked. Finally add the peas and cook for a further few minutes until tender. Season to taste. Break the spaghetti up into small pieces (about 6 cm./2 inches long) into a large saucepan. Cover with the water and turn up the heat to full. 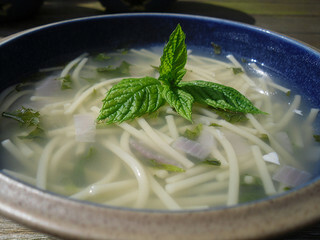 Bring to the boil while you prepare and add the other ingredients with the exception of the mint. Once boiling turn down to simmer for about 15 minutes until everything is cooked. Add the mint and cook for a further 2 or 3 minutes and serve sprinkled with generous amounts of chopped fresh parsley (optional but it was really good!). Don’t worry – they don’t sting when cooked! 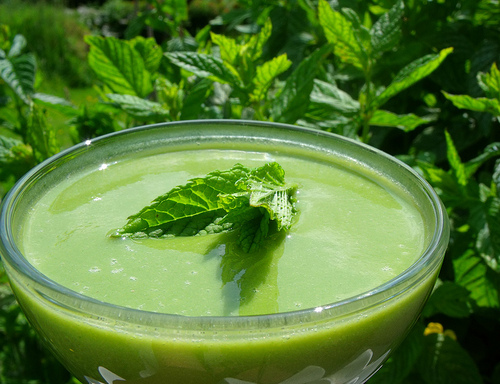 Nettles are very nutrient rich and of course – free! Don’t gather them beside a busy road where they will have been contaminated by traffic fumes – we pick them in our garden. If you keep cutting them from springtime you get a regular supply of fresh leaves. Though we stop using them into summer as they seem to get rather insecty! Heat the oil in a saucepan and fry the onion and garlic for a few minutes. Add the peas, mint and nettles and cover well with water. Bring to boil and cook for 10 minutes or so until the peas are properly cooked. Liquidise, taste and add salt to preference. 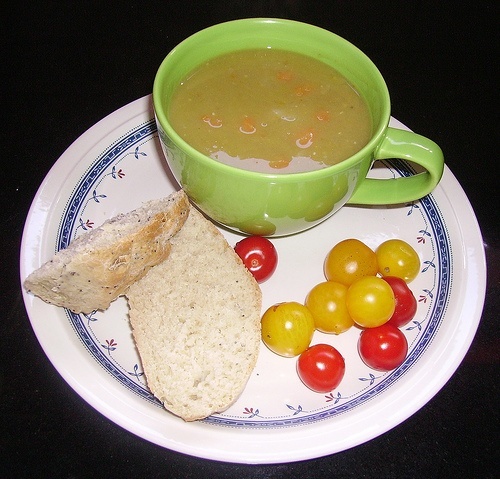 A small pea soup related joke: you must answer “pea green soup” to all questions – go on! What did you have for breakfast? What did you have for lunch? What did you have for dinner? What did you do all night? 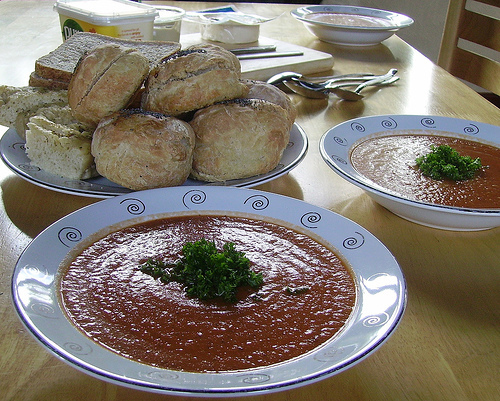 Apologies… the joke may be bad but the soup is not – it’s thick and delicious! This is so basic it hardly constitutes a ‘recipe’! It is very simple and fairly bland – children love it. Fry the onion in the sunflower oil for a few minutes to seal the flavour then place all the other ingredients except the kale or cabbage in a pan and cover with water. Bring to the boil and simmer until the vegetables are cooked (15 – 20 minutes). Add the green vegetables 5 – 10 minutes before cooking is finished to prevent them being over-cooked. Mash well. 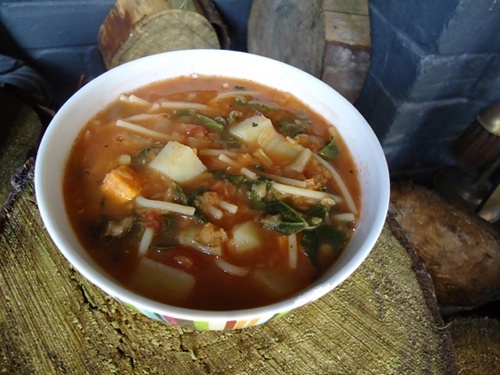 The quantities given make quite a large pan of soup – we eat half one day and store the rest in the fridge until the next day – you may wish to change the quantities to suit your needs. Fry the onion and garlic in the oil for a few minutes and then add the carrot and stir well. Add water and bring to the boil – turn down to simmer and cook for about 15 minutes until the carrot is cooked through. Add the beans and cook for a further 5 minutes or so until they are properly heated through. Season and liquidise – was nice left a little rough but you might prefer to keep going until smooth. Well, I have to do the lurgy soup don’t I? Cold and bright, brrrrrr, and temperature dropping every night so.